Outdoor chess table is perfect also for outdoor or garden party. You can use it as party decoration by put it in your outdoor party and lay the chess pieces set on the table. Looks elegant and attractive with its perfect furnishing. Polished in black and glossy make it perfect for outdoor use. You can play chess with your partner at your garden or backyard. Beside that, if you need some unique touch for your garden party, just put this kind of table and make sure that your guest feel surprised with its beautiful carving. 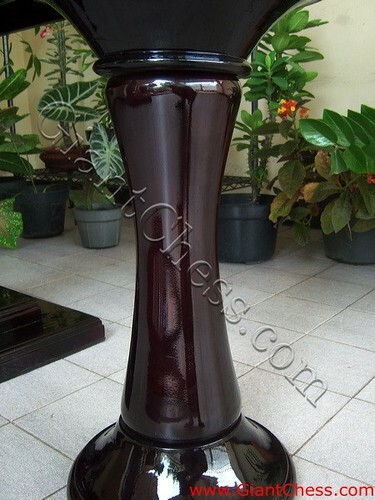 The chess table is very strong and durable furniture, because it has made from best quality of Teak wood. Look its bottom part. We make it carefully in order to make it strong in any seasons and weathers. Beside black color, you can also get natural brown, antique brown, dark brown or others. Those products made by our expert craftsman and produce the unique furniture for your house.